Dar Drissi is a traditional house in the ancient Fez Medina in Morocco. The Fez (or Fes) Medina is a walled city founded more than a millennium ago and permanently occupied since then. It offers a rare and fascinating insight into the history and culture of the Moroccan people. Traditional houses are called "Dars" or "Riads". This house is at least 250 years old. It has been extensively and painstakingly restored using traditional crafts to complement its original features, most of which survive intact. It has been converted into a charming guest house with modern en-suite facilities discreetly installed to preserve its original ambience. All bedrooms are air conditioned, providing cool air in the summer months and warmth during the winter. Rooms may be rented individually or the whole house may be rented for your exclusive use. Double rooms are available from 49 Euros per night (39 Euros per night in Low Season). Please see our prices, terms and conditions on the Prices and Offers page. Whether you rent a room or rent the whole house the accommodation package includes bed and breakfast, a private bathroom, air conditioning and the assured attention of our staff throughout your stay. We will also take care of you from the point of your arrival at the airport or train station until your eventual return there. For those that like to stay in touch there is free Wifi for your use. We are confident we can provide our guests with a delightful experience at a reasonable cost. Dar Drissi is a beautiful and spacious property that boasts a magnificent courtyard with fountain. 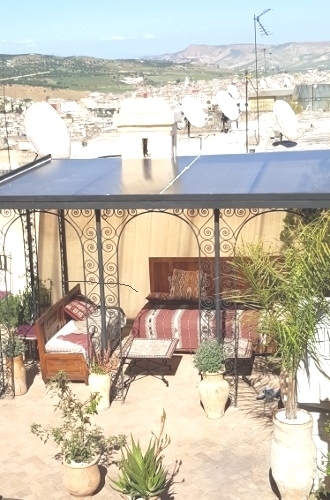 It has a large roof terrace offering shelter from the sun and superb views over the Medina and of the Atlas Mountains beyond. It is located at the western end of the Medina between the well known shopping streets of Talaa Kebira and Talaa Seghira. It is less than 10 minutes walk from the Ain Azliten car parking area, which is the usual taxi stop. 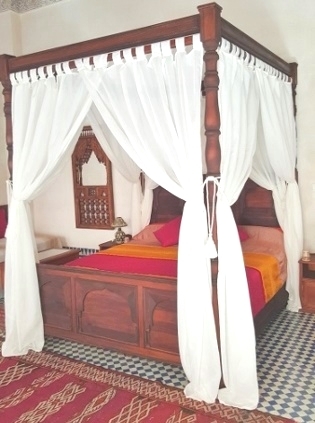 Dar Drissi is an ideal base from which to explore the Medina and other parts of Fez. Our staff will be delighted to offer advice and assistance to plan your sight-seeing trips. They can arrange guides and book taxis and restaurants. They can also arrange trips beyond Fez. For example to the ruins of the Roman city of Volubolis, the nearby city of Meknes or into the Atlas Mountains. Please follow the instructions on the Availability and Reservations pages to book your stay. Or Contact Us to find out more. We look forward to hearing from you!